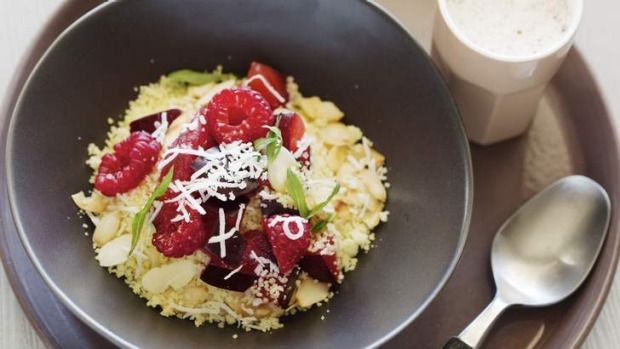 Grains for breakfast that go beyond the ordinary porridge or muesli; do a balanced mix of grains and fresh fruit, adding things such as pistachios, sunflower seeds, flaked almonds, yoghurt, dates and currants as you see fit. 1. Pour 200ml boiling water over the cous cous and butter, and leave for 5 minutes to absorb, then fluff up the cous cous with a fork. 2. Gently heat the milk with half the coconut, the sugar and cinnamon until hot, not boiling, whisking to dissolve sugar. 3. Divide the cous cous between four bowls and top with berries and sliced plums. Scatter with remaining coconut and flaked almonds; serve with the warm milk.